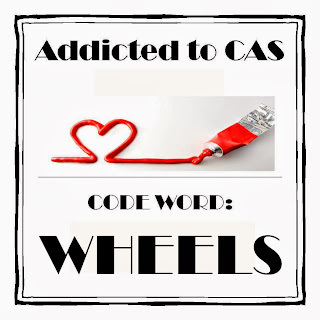 Less is More and Addicted to CAS have very similar challenges this week and although one card would have done I made two!!! You may interpret this as you wish, but we must be able to recognise the connection! We are now up to Challenge #35 and your hostess this fortnight is Sylvia. Here's what I came up with although the wheels on the bus were etched on my brain! I cut out three circles the same size as some Artemio stamps that are NBUS and used a matching ink to stamp them in the apertures. I diecut a label shape and stamped a WOW sentiment in it. Three pearls to finish it off as it looked a bit bare. This one is simply kraft card with embossed lines edged with a white pen and the bike was cut with my Silhouette, which is back in use since my computer is running perfectly now :) Once again a WOW sentiment embossed in white. Apologies for the poorly lit photos but the bulb went in my craft room and the replacement was a lower wattage! Two great cards Val, I have those Artemio stamps, there very versatile. I`ve had the wheels on the bus rolling around in my head since saturday. It`s driving me insane now lol. I love the kraft n pink combo :) great CAS cards, thank you for sharing with ATCAS!! Great cards thanks for joining us over at Less is More hope you will join in again next time. Two great cards Val, both fab for our challenge at ATCAS. Thanks so much for joining us. Sounds like Dom & Keir spoilt you! So glad your Mother's Day was wonderful! Your first card is really pretty and your design brings interest with it! I really like the images you chose for your circles too. Your second card is too too cute. Like how you did the embossed lines too!